This was once a dingy lot. Every neighborhood’s got them. Some seem to have them everywhere you look. Empty lots, dark alleys, abandoned buildings, dimly lit spaces under overpasses. These are the places that you want to avoid at night. You’re not too enthusiastic about encountering them during the day. They seem like magnets for trouble, and this idea is borne out by research showing that ecological factors can contribute to certain small areas becoming ‘hot spots’ for crime (Felson, 2006) and that crime trends may vary from street to street (Groff, Weisburd, & Yang, 2010). Graffiti often finds its way to these neglected spaces, sometimes bearing offensive text or images, as if sending another message that this is a place you do not want to go near. But graffiti can be a tool for renewal as well. 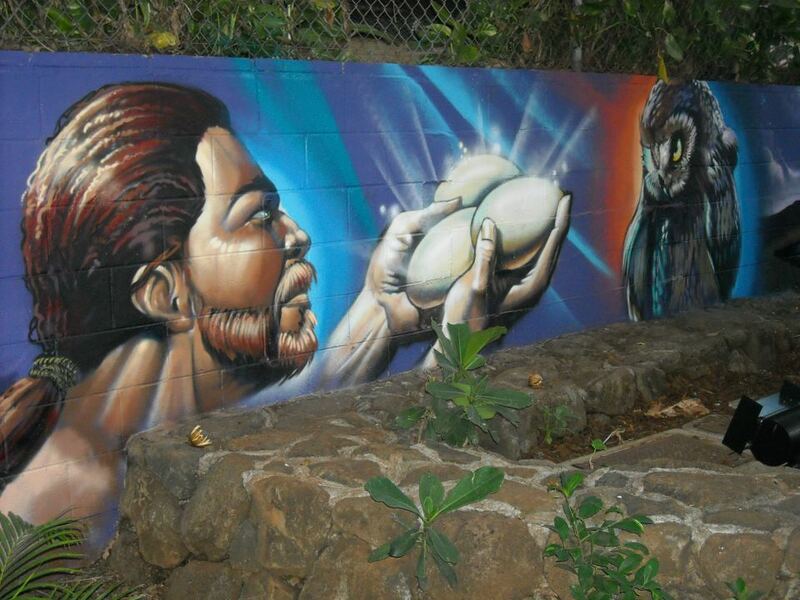 Across the U.S., street art is being used to make once unsavory places beautiful. In the latest edition of The Community Psychologist (Community Ideas column, p. 10-11), I spotlight work that was done by 808 Urban, a Hawaii-based arts collective that works with youth. This initiative was prompted by one concerned and persistent citizen, and facilitated by a community police force that recognized that recognized patterns of crime centered on a small abandoned lot. Was I at the right place? I certainly didn’t remember the bus stop looking like that. Moreover, behind the bus stop I saw what looked like a mini park, surrounded on three sides by beautiful murals. I confirmed that I was in the right place, but was taken aback by the change. The full story of how this change came to be is in The Community Psychologist article, but suffice it to say, the place had changed. It has been nearly a year since that happened, and I still smile every time I arrive at that stop. Waiting for the bus home is no longer a dreaded activity, since spotlights shining on the murals serve to brighten up the place, and keep most would-be lurkers away. The change is even bigger for those who live there, who once found this place at best annoying, and at worst disgusting and scary. Instead, the mini-park is now a source of pride. In the wake of controversy over New York’s stop-and-frisk policy, and debates about how crime can be effectively prevented without violating people’s civil rights and unjustly targeting minorities, it’s refreshing to hear about a community policing effort that was based on partnership and mutual respect. Much of the aggressive policing that has dominated law enforcement in places like NYC is based on the “broken-windows theory” that posits a connection between physical disorder and crime. Typically, police forces that subscribe to this theory take a hard-line approach to minor violations such as public drinking or graffiti. However, there are many downsides to this approach. For instance, studies have shown that while physical disorder is associated with fear of crime, so is excessive policing (Hinkle & Weisburd, 2008). A fascinating project in the South Bronx culminated in community members and researchers projecting statistics regarding excessive use of stop-in-frisk in one neighborhood*. At the end, this message was projected “We want to feel safe…and we want you here. We deserve fair and just policing.” Community members and police forces are for the most part united in their desire to create safe neighborhoods. Partnerships that lead to urban renewal may be more effective ways of decreasing neighborhood disorder and thereby preventing crime, without relying on aggressive policing. Felson, M. (2006). Crime and nature. Sage Publications, Inc.
Hinkle, J. C., & Weisburd, D. (2008). The irony of broken windows policing: A micro-place study of the relationship between disorder, focused police crackdowns and fear of crime. Journal of Criminal Justice, 36(6), 503–512. Acknowledgements: Thanks to Michelle Fine for sharing the above linked video of the Morris Justice Project during her keynote address at this year's SCRA conference. 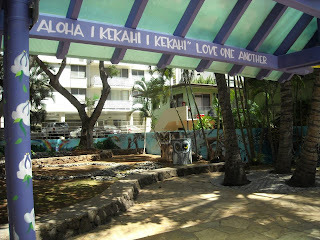 Many thanks to Melody Young, Thomas Foti, and Officer John De Mello for their work on the Kuhio Mini-Park project and for taking the time to speak with me about it.